Fate! Mark Reynolds saw the gun’s potential immediately, an impulse founded on years of experience as much as upon carefully reasoned thought. Ambling about at the 2009 Shooting Hunting Outdoor Trade (SHOT) Show, Mr. Reynolds met Iñigo Lopez, director of the prestigious Spanish sporting arms maker, Aguirre y Aranzabal (AyA), at its exhibition booth. During a congenial chat, Mr. Lopez handed Mr. Reynolds a prototype of a round action boxlock 12-bore shotgun. He informed that the gun would not be put into production because he believed the gun would be too expensive to produce and, thus, would not sell at a price the market would accept. Mr. Reynolds had a different vision of the gun and its marketability. He saw uniqueness, for, to his knowledge, this round action boxlock would be the first produced by a Spanish maker. In his mind’s eye he saw images of the gun with upgraded wood and superior hand engraving in the deeper-cut ornamental style as opposed to the more traditional shallow English scroll style. He calculated that such an up-graded custom model would compete successfully against the far more expensive Italian and other European boxlock models. “I thought it would be a knock-out gun,” Mr. Reynolds told me. The rounded body helps make the Bournbrook an excellent value. Mr. Lopez agreed to produce the model when Mr. Reynolds committed to purchase a meaningful number of the guns and to give Mr. Reynolds exclusive rights to the model in the United States. Mr. Reynolds’ strategy was to take advantage of AyA’s superior craftsmanship to create a semi-custom “best quality” boxlock gun based on the unsurpassed Anson and Deeley patents. Having faith in his ability to guide the production of an aesthetically and economically competitive product, Mr. Reynolds began negotiating with Mr. Lopez regarding timing of the production of the guns, grades of wood and engraving patterns. Mr. Lopez was receptive to Mr. Reynolds’ overture because the relationship would advance AyA’s strategy to create new niche markets for high-grade, Anson-Deeley, round-body, boxlocks in the United States and Europe. A brief historical note is helpful to understand Mr. Reynolds’ affinity for AyA firearms. The Basque Region of Spain is in the western Pyrenees that spans the border between France and Spain on the Atlantic coast. Eibar, a city and municipality, is in the province of Gipuzkoa, one of three Basque Provinces. Situated in a narrow mountain valley cut by the Ego River, Eibar is the center of Basque gunmaking. Eibar was chartered by Alfonso XI of Castile in 1346. Its chief industry since the 16th century has been the manufacture of armaments, particularly finely engraved small arms. The era of fine gunmaking in the English tradition began in the Basque Country during the Peninsular War, when Napoleon's troops were driven out of Spain by Spanish guerrillas and British forces under the Duke of Wellington. Wellington's officers took home gun barrels of Spanish steel, renowned for its strength, and had them made into fowling pieces by London gunmakers such as the Manton brothers. As the English perfected the game gun in the late 1800s, the passion for fine guns crossed the Bay of Biscay and established itself in the Basque Country. 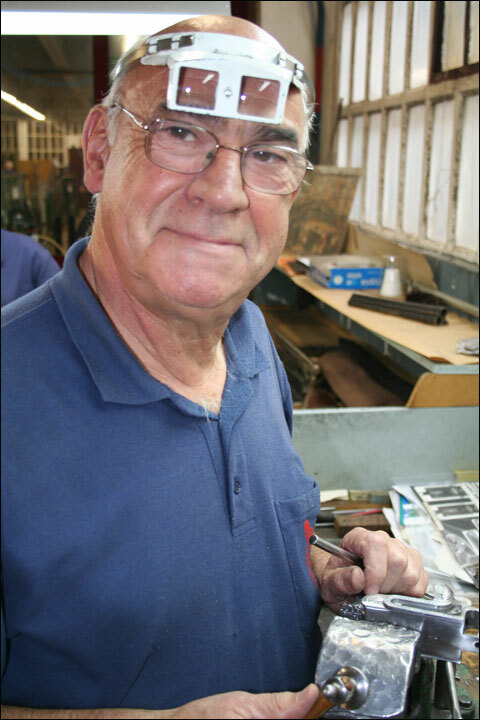 AyA’s founding was influenced by Eduardo Schilling, a skilled German gunmaker in Catalonia, near Barcelona. Schilling's reputation spread to the Basque Country, enticing two young gunmakers from Guipuzcoa, Miguel Aguirre and Nicolas Aranzabal, to work with him. They returned home in 1915 and founded Aguirre y Aranzabal. In the mid-1950s, two English brothers, Andrew and Peter King, traveled to Spain and visited gunshops in Barcelona and AyA. Agustín Aranzabal saw an opportunity to penetrate the United Kingdom market. The King Brothers provided AyA a Holland & Holland sidelock and a Westley Richards boxlock with the standard Anson & Deeley action. These actions became the core of the AyA lines. Presently AyA is a preeminent manufacturer of firearms in Spain. All components for their firearms are made in-house. It is the only Spanish gunmaker that controls the entire machining process. Dedicated to the highest quality even in their lesser expensive models, AyA is acknowledged as a builder of “best” guns that favorably compare with the world’s finest sporting arms irrespective of cost. The elegant lines of the Bournbrook. The two patenees of this invention were William Anson and John Deeley. John Deeley joined Westley Richards in 1860 and became managing director. His first patent was in 1873, followed by more than thirty patents, Gold Medals and Royal Warrants during the next twenty five years. William Anson was a foreman in the Westley Richards & Co. Ltd. machine shop when the invention was patented. The Anson & Deeley action is the most successful and widely used mechanism throughout the world. The action possessed what Crudgington and Baker describe as “the considerable virtue of simplicity.” The strength, simplicity and reliability of the action determined its selection by Mr. Reynolds. Westley Richards was originally located in the Bournbrook area of Birmingham. Mr. Reynolds named his gun the Bournbrook to honor the heritage of the Birmingham guns and the roots of the original designers of the famous action. His theory was to focus on the aspects of fine guns people are most passionate about: engraving and wood. 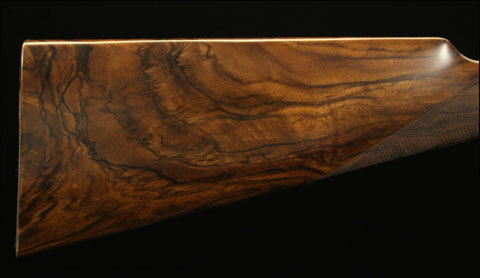 They are the personal touches that make a gun bespoke and elevate it from a tool to art. AyA’s Chief Engraver, Juan Luis Guenaga. 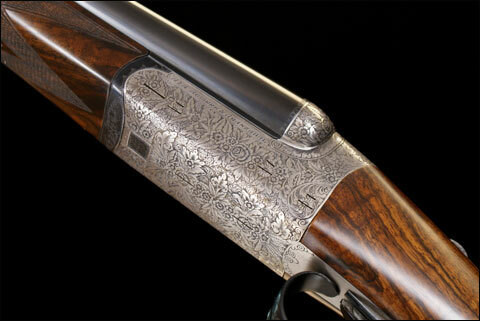 The keystone to Mr. Reynolds’ vision for the gun’s economic success was that it be completely hand engraved. 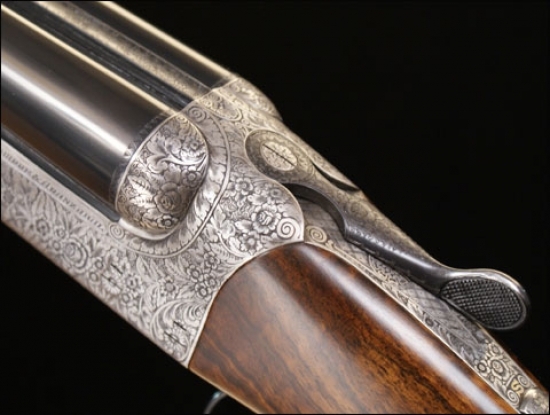 He began studying an array of best engraving patterns with particular scrutiny paid to a David McKay Brown side by side engraved by Creative Art of Gardone Val Trompia, Italy. After about a year and a half into the project, Mr. Reynolds reached agreement on a pattern selected by Juan Luis Guenaga, AyA’s chief engraver, employed by AyA for forty years and designer of the most famous AyA engravings. The selection of the wood represents a unique aspect of the Bournbrook’s premise and marketing. Mr. Reynolds realized that the high-grade wood he desired would exceed his price point if it were supplied by AyA. Thus, he buys his own wood and offers it at no additional cost to AyA and at a reduced cost to the consumer. One important benefit that arises from this approach is that customers choose their own wood, making the gun truly personal. “They paint the painting,” Mr. Reynolds said. Mr. Reynolds travels to three suppliers to hand pick every blank. He selects only English genetic walnut, now grown in California, and Circassian walnut from Turkey and neighboring countries such as Armenia and the Republic of Georgia. One of the numerous selections available with the Bournbrook. AyA offers four grades of wood: #2, #1, Special and Exhibition, the latter two grades offered on guns costing over $10,000.00. Mr. Reynolds offers the equivalent of the Special and Exhibition grades. The Special grade is standard on the Bournbrook and the Exhibition grade is available for a slight price upcharge. The Bournbrook includes features not typically included on boxlock firearms such as an articulated front trigger, best hand rubbed oil finish (found on AyA Models #1 and higher grades), demibloc barrel construction and disc set firing pins. The Bournbrook is available in 12, 16, 20 and 28 gauges and in .410 models. The action employees the Purdey double underbite locking system with a replaceable hinge pin. In April 2011, Shotgun Life published the story How Does Spain’s AYA Model Nº 1 Round Action Bird Gun Stack Up Against England’s Best? After shooting the AYA and having it examined by the gunsmiths of Griffin & Howe, the answer came back that the AYAs provide to be an excellent value for a high-quality shotgun. Now with the foresight and attention to detail provided by Mr. Reynolds, the value proposition that measures the best of the Spanish against the best of the English has tipped a slightly more in favor of the new owner. Michael G. Sabbeth is a lawyer in Denver, Colorado and author of the book The Good, The Bad & The Difference: How to Talk with Children About Values. Please visit his website: www.kidsethicsbook.com.